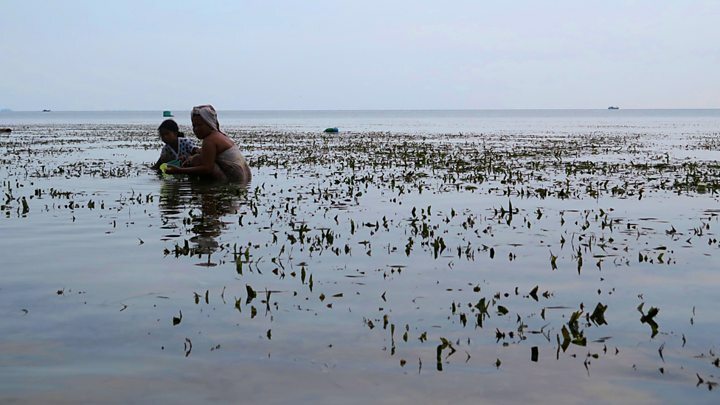 Media captionJoleah Lamb: "We need to put a dollar sign on seagrasses"
The importance of seagrasses to the health of coastal ecosystems is underlined in new research conducted around Indonesian atolls. These underwater flowering plants, which have been with us since the age of the dinosaurs, have long been known to have anti-microbial properties. But the latest study demonstrates that their presence really does help to suppress pollution. Coral reefs also seem to be in a better condition when the grasses are nearby. Although these plants grow in vast meadows, fringing every continent except Antarctica, they are also being damaged on a large scale by human activities, with global losses estimated at 7% each year since 1990. Dr Joleah Lamb and colleagues tell this week's Science Magazine that the "ecosystem services" provided by the grasses should be valued more highly. The plants cycle nutrients, stabilise sediments, act as a "sink" for carbon dioxide, and provide nursery habitat for fisheries. "The plants play so many important roles and what we've shown is just another reason to support their conservation," the Cornell University, New York, researcher said. Dr Lamb described her work here in Boston at the annual meeting of the American Association for the Advancement of Science (AAAS). Her team sampled seawater in the vicinity of four islands close to Sulawesi where untreated wastewater is allowed to get into the ocean. Using a genetic probe, the researchers measured the levels in the water of Enterococcus-type bacteria, which can cause infections in humans, fish and invertebrates. They found the load of these potentially pathogenic marine bacteria to be reduced by half when seagrass meadows were present, compared with sites that did not have the plants. "We don't really understand the exact mechanisms that are driving the reduction in the load of harmful bacteria, but it could be the result of the seagrasses themselves and their natural chemistry, or the other organisms that are filtering the water within the seagrass meadows," she told BBC News. "But it could also be that because they're plants, they're adding a lot of oxygen to the water through photosynthesis. That's interesting because wastewater treatment facilities will often use pulses of oxygen to deactivate bacterial pathogens." Seagrass meadows and coral reefs are tightly linked habitats, and the team also examined more than 8,000 reef-building corals at the atolls for visual signs of the tissue loss that is characteristic of active disease lesions. The scientists did this along reefs with and without adjacent seagrass meadows. And, again, the prevalence of disease was 50% less on those reefs paired with seagrass meadows. The mechanism here could have something to do with the way the plants anchor sediment, preventing it from moving over corals. Other studies have suggested pathogens could be transmitted this way on sediment particles. Seagrass meadows are being damaged worldwide, through coastal development, port development, destructive fishing practices, and excessive sediment run-off from land. But the hope is that this study will make people sit up and take notice of what seagrasses offer. And co-author Jeroen van de Water, from the Scientific Center in Monaco, put forward one suggestion that would certainly raise their "dollar value". "Aquaculture is undergoing a big increase worldwide because of the global food shortage. But because marine organisms (in fish farms and the like) are densely populated, disease outbreaks are quite a problem. "Maybe it would be interesting to integrate seagrass treatment systems with aquaculture, to reduce the cost on the environment but also economically."